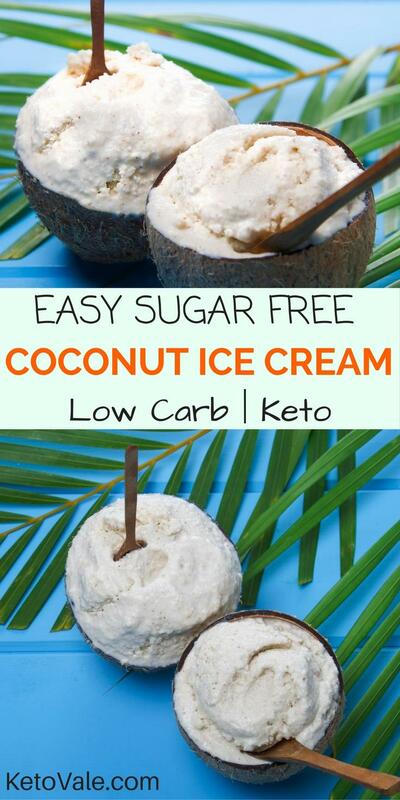 The coconut is one of the best fruits to make ice cream, especially if you follow a ketogenic diet. Coconut oil contains special fatty acids called medium chain triglycerides (MCTs) that have many incredible health benefits. When talking about coconut products, we talk about coconut milk, coconut cream (no added sugar), coconut oil and coconut flour or shredded coconut flakes which are derived from coconut meat. 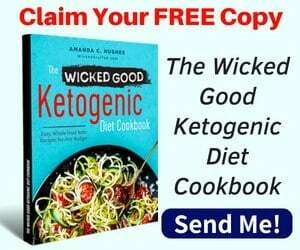 We don’t want coconut juice (water) as it contains quite a lot of carbs for keto standard. 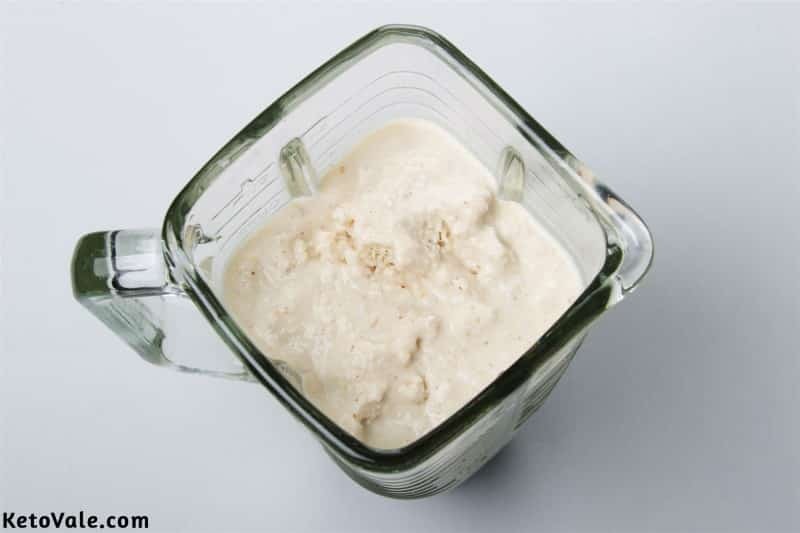 This low carb, healthy and keto-friendly ice cream recipe is pretty simple and easy. For the main ingredients, we only need egg yolks, full-fat coconut cream, and heavy cream. 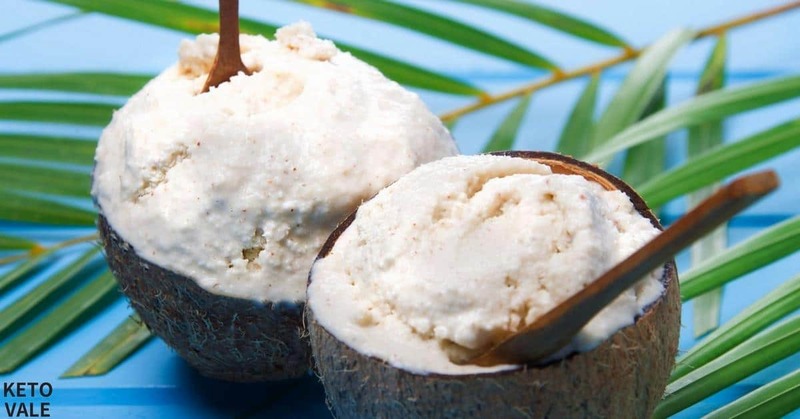 The reason you want to have full fat coconut cream is to have the ice cream consistency. Regular coconut milk will not make it. When choosing coconut cream, make sure it’s full fat, sugar free, and gluten-free with no preservatives. The ingredients should be just coconut extract, water and maybe guar gum (thickening agent). A good brand to choose is Thai Kitchen’s Coconut Cream. For taste, we add a little bit of vanilla, cinnamon, keto-friendly sweetener and some desiccated (shredded) coconut. Beat the egg yolks and the sweetener with the mixer until they are creamy. In a medium pot over low medium heat, put the heavy cream in then the egg yolks mix, cinnamon and vanilla. Stir constantly until all the ingredients are well integrated. This process helps to cook the egg. As soon as you notice it is bubbling around the edges, remove from the heat to avoid overcook. 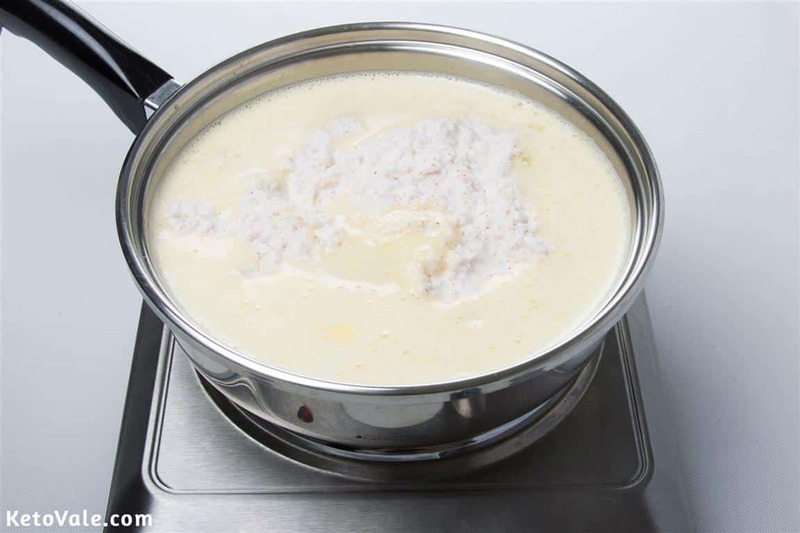 Add the coconut cream and shredded coconut (if using) and stir to thicken to a custard consistency. When the mixture is at ambient temperature, store in the freezer and remove every two hours and stir to break up any ice crystals. This process must be repeated at least twice to ensure that the ice cream is creamy and without crystals. Serve the ice cream with some grated coconut on top. 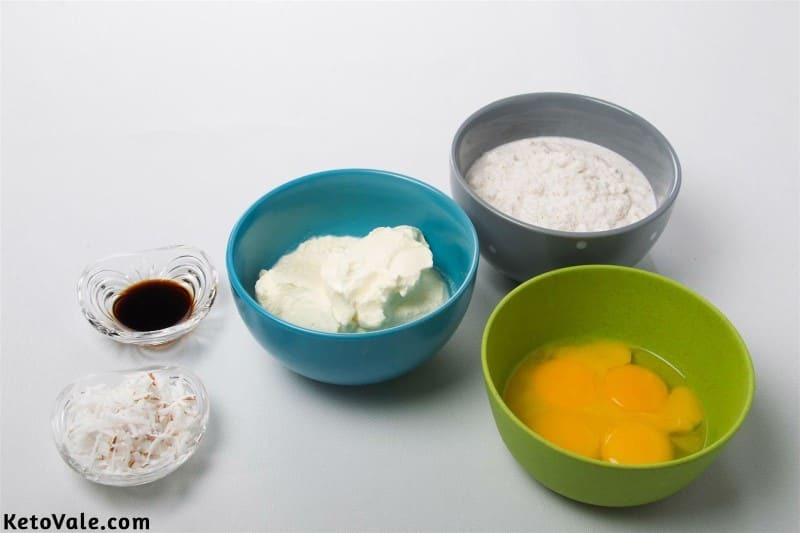 Start by beating the sweetener and egg yolks together in a mixer. Blend until homogeneous and creamy. Pour the beaten egg mixture into a medium pot over low medium heat. Add the vanilla, cinnamon, and heavy cream. Keep stirring until the ingredients combine fully. This helps cook the egg yolk. Once the edges of the mixture start bubbling, turn off the heat so as not to overcook. Stir together with the coconut cream and some shredded coconut if preferred. Fold continuously to make a thick, consistent custard texture. When the mixture cools down to ambient temperature, freeze for 6-8 hours. Take out from the freezer once every two hours. Mix with a spatula to dissolve any ice crystals formed. Repeat for at least two times for a creamy and crystal-free ice cream. Remove from the freezer once ready to serve. Top with some grated coconut.